Find color-coded pressure washer nozzles and tips that can provide a wide range of stream pressure, dictated by orifice size, and degrees of spray for whatever application needed. 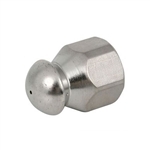 We carry high pressure hose nozzles for pressure washers, like quick disconnect, meg and turbo nozzles that can be adjusted on the fly. If you have a task or business that requires multiple degrees of spray be sure to shop our 4-pack high water pressure spray nozzles that vary in orifice sizes and degrees. If this power washer nozzles page doesn’t contain the right part then our friendly technical staff would be happy to locate what you need quickly. Contact us either through email at info@pwoutlet.com or through our phone number, 877.277.1988. We treat all of our customers like one of the family and offer a 30-day NO HASSLE return policy because gaining a lifetime customer is more important to us than a single transaction. Orders of $100 or more include FREE shipping to your home or business.